What Happens When An Aid Group Sees Abuse, But Is Sworn To Secrecy? 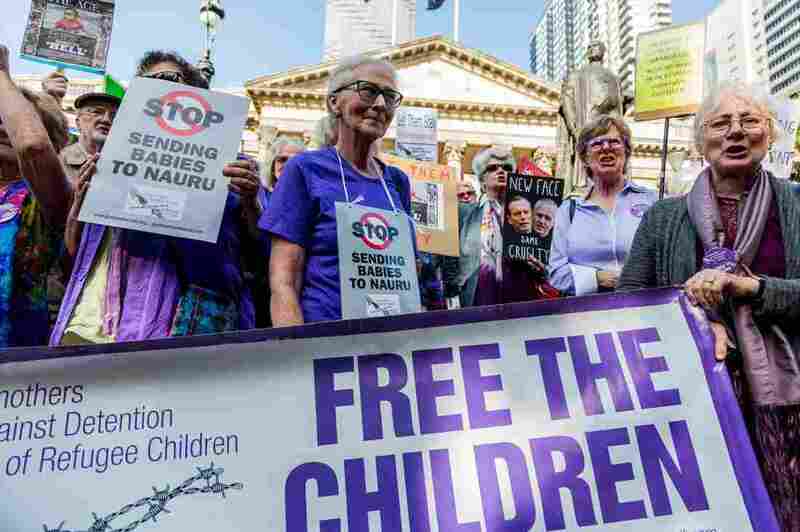 : Parallels Save the Children had to sign confidentiality agreements to work at a migrant detention camp run by Australia in Nauru. The group's Mat Tinkler discusses what they did and didn't say about abuses. Australian protesters demonstrate in Melbourne on Feb. 4 after the Australian High Court upheld a challenge to the government's right to hold asylum seekers at detention camps in Papua New Guinea and Nauru. When Save the Children Australia signed up to help migrants that Australia was detaining on a remote island in the Pacific Ocean, workers for the aid group had to sign confidentiality agreements. Australia's government required the agreements. While unusually strict, they reflect a bargain many aid agencies must make in troubled areas of the world: to gain access to vulnerable people, they must remain diplomatically silent about what they see, avoiding embarrassment to the governments. The agreement imposed by Australia served as an example of what may happen behind that veil of secrecy. Children placed with their families in a camp on the isolated island of Nauru suffered sexual and other abuse. The scale of the problem was not publicly exposed until a former aid worker violated that confidentiality and acted on her own. That former worker, Viktoria Vibhakar, told NPR on Wednesday that as a result, abuse, including the abuse of children, was largely ignored. "I chose to make a report, an anonymous submission detailing the abuse and systemic violations of human rights to children and families on Nauru and I attached several thousand pages of documentation as well and I sent it to the [Australian Human Rights] Commission," Vibhakar told NPR Morning Edition host Steve Inskeep. Australia's immigration minister, Peter Dutton, has played down allegations of abuse and has stressed Australia will not change its policy of blocking migrants from coming to Australia. He says smugglers would bring large numbers to Australia by boat if the country changed its policy. Australia did agree to shut down a detention camp in Papua New Guinea last week, but the one in Nauru remains open. There were 543 asylum seekers at the Nauru camp, including 70 children, as of last November, according to the Australian Human Rights Commission. Mat Tinkler, the director of policy and public affairs at Save the Children, spoke to Inskeep via Skype about the confidentiality agreement and how the group responded when it became aware of abuse. Why did Save the Children agree to the confidentiality agreement? Because it was a condition of supporting children in that terrible environment. So that is correct. We were required to sign confidentiality agreements. I've signed one myself. What that means is when we saw rights violations or the impact of detention that was grave enough to warrant us speaking out publicly we would do that. But it was important that we did that in a careful and controlled manner. It wasn't appropriate that we had all of our 300 staff members speaking to the media about any incident they may have observed. That would not have allowed us to continue working in that environment; our contract would have been terminated. I'm trying to get a sense of why Australia felt it necessary to demand such strict confidentiality. My view on this is that the Australian government has deliberately cloaked this area in secrecy because if the Australian public had a full view of the impacts of its policy, they would not support it. There's no independent human rights monitor or child rights advocate working in the detention environment working in places like Nauru. And there should be. So what happened behind that cloak of secrecy on the island of Nauru? So one of the things I'm very proud of is that Save the Children was the agency in that environment who was essentially the conscience of the island. So when children didn't have appropriate footwear, we were the ones advocating to get them decent shoes. When children were being educated in a tent, we were the ones advocating to get them out of those tents and into an air-conditioned facility so that they could actually learn. And publicly we were the ones advocating to end this process, because the impacts and the harm being done to children and their families were extreme and should not be tolerated in a country like Australia. But when the Australian Human Rights Commission came around asking, not about kids shoes but about child sexual abuse and criminal violations, we're told that Save the Children told them nothing. Well that's not correct. I gave evidence in person to that Human Rights Commission inquiry, and we also provided a written submission to the inquiry. The commission very much understood that we had to play a very careful balancing act here between providing evidence to the inquiry and maintaining our position in Nauru. And I can tell you that the commissioner herself told me that it was in everyone's interest that Save the Children remain in Nauru, and therefore she understood that our evidence needed to be finely calibrated. Importantly, however — and this is a really key point — the fact that we didn't say publicly to that commission [that] we observed incidents of child abuse does not mean that we weren't reporting consistently any type of issue that we observed like that through the government. This was standard practice — it happened all the time, I've got to say, and far too often on Nauru — when our staff observed that kind of incident, we would alert the government, we would alert all the service providers, we would alert the police on Nauru, we would make sure that incidents were investigated to the best of our ability. But ultimately it was a matter for the government then, what they did with that information. It wasn't a matter for us to determine. You used the word "calibrated." You calibrated your testimony to the commission. Do you have some sympathy then for former Save the Children employees who felt that the organization didn't reveal enough and ended up giving their own documents to the inquiry? Yes, I have some sympathy for them; those people worked the coalface of human suffering on Nauru, and I can understand why this is a highly emotive and personal issue for them and they want to see justice for those people and I'm not going to criticize that at all. But what I will say is most staff would have been or would have had that opportunity to observe and work and support those children and speak to the media now as some of them are doing, had we not stayed on Nauru. And I can tell you that the night I gave evidence to that Human Rights Commission inquiry, we had a phone call from the government threatening to terminate our contract because I gave that evidence. Did you feel that you were in a morally treacherous place? When I went to Nauru I came back feeling like I'd witnessed a stain on history. And I felt like I'd witnessed something that would be judged very harshly over time and how we responded to it was to, to walk this fine line as best we could around providing support for those children and helping them and their families. An earlier version of the online story referred to multiple aid workers violating a confidentiality agreement to report abuse. It was only one aid worker, Viktoria Vibhakar.